Terri is a dynamic, collaborative finance leader with over 28 years of experience building exceptional teams, effective accounting and reporting systems, and producing results. Her experience includes 17 years in public accounting and 11 years in private finance and accounting. She has broad experience with strategy development and finance in various domestic and international industries, including real estate, hospitality, services, nonprofits/foundations, health care, manufacturing, maritime and family offices. Terri is sought as a trusted advisor for her strategic thinking, operational focus, strong technical and organizational skills, practical problem solving ability, and focus on continuous process improvement. She is adept at managing multiple projects and priorities in challenging environments, using humor to make projects enjoyable and motivate teams. Areas of focus include strategic planning, risk management, investment monitoring and analysis, investor/lender relations and meaningful financial reporting, financing, M&A, complex structures and consolidations, operational efficiency, cash flow management and forecasting, financial modeling and analysis, budget development and monitoring, audit and compliance and team development and mentoring. 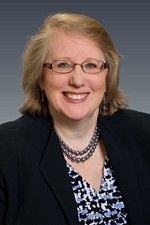 Terri was previously the Senior Director of RE Finance and Business Operations at Vulcan, Inc., the management company for Paul G. Allen, where she was responsible for the finance aspects of the real estate portfolio, safari camps, homes, yachts, planes, family foundation and other personal assets. 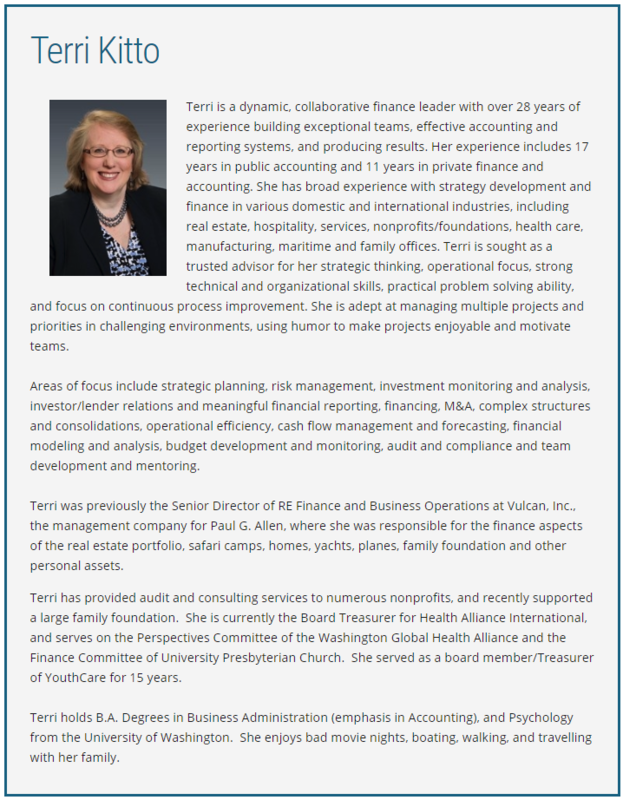 Terri has provided audit and consulting services to numerous nonprofits, and recently supported a large family foundation. She is currently the Board Treasurer for Health Alliance International, and serves on the Perspectives Committee of the Washington Global Health Alliance and the Finance Committee of University Presbyterian Church. She served as a board member/Treasurer of YouthCare for 15 years. Terri holds B.A. Degrees in Business Administration (emphasis in Accounting), and Psychology from the University of Washington. She enjoys bad movie nights, boating, walking, and travelling with her family.